With thorough knowledge of varied aspects of the market, we have been able to come up with a range of Mounted Points. Made with brown, pink or white aluminum oxide and black & green silicon carbide, these are offered by us in vitrified as well as resin bonds forms in all popular Shapes. 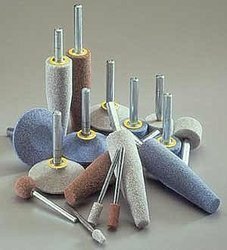 The mounting points we offer are extensively utilized for the purpose of grinding hard to reach corners and deburring sharpening. Further, clients can buy these mounted points and wheels from us in different standard shapes & size as per their needs. Established in the year 1997, M.B. Associates is based in Secunderabad, Telangana, India as a sole proprietorship based firm.We have established as renowned wholesaler, supplier and trader. We deal with all kinds of Silicon Rubber products,Silicone Grease,Silicone Oil wide range of couplings, S.S. Ferrule & Pneumatics Fittings, SS 304 316 coupling, carbide tip & Carbide,Cutting Tools, Hand Tools, Toughened side glass, SS and high tensile fasteners, SS & MS Seamless, ERW pipes and fittings, all kinds of valve chains and sprocket, lifting and pulling equipments, Hydraulic and pneumatic product, Industrial & Dairy Sanitary Valve TC End, TC Ferrul, and Building Material Hardware and much more. We procure quality range from reliable vendors all across the country. So, as to ensure the delivery of quality-oriented range to our clients. Under the guidance of our mentor, Mr.Murtaza, we have been able to reach an optimum height of success in the market. His zeal and motivation has helped us to achieve great success.